One of the great contributions that Teilhard de Chardin made to Christian theology is his reconciliation of traditional Christian theology with evolutionary biology. Science has continued to advance. Discoveries in the past 100 years, from the Big Bang to particle physics provide additional evidence in support of the monotheistic belief that there is an intelligent Creator of the Universe. 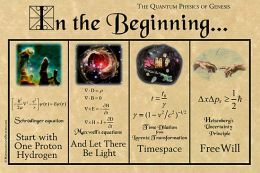 Moreover, the strange world physics of quantum mechanics also supports the notion that this Creator is relational, similar to the Christian belief in the Trinity. “In 2007, I gave a lecture on evidence in the cosmos for the God of Christians. It was precisely based on quantum physics. Nothing has changed since then other than the fact that we are now aware of many more facts in human behavior, the accelerating rate of the development and deployment of information technology, the development of life on earth for billions of years with its challenges, and more knowledge on the intricate nature of the expanding cosmos. Those who wish to remain in their simple faith and ignore scientific advances may well find themselves surrounded by questions from their friends, children or grandchildren: Why do you still believe? John Polkinghorne, retired professor of mathematical physics at Cambridge University, wrote, in one of his latest books: Quantum Physics and Theology in 2008, about relationship as science is attempting to discover it at the subnuclear level: “Quantum theory brought to light a remarkable form of entanglement between subatomic particles that have once interacted with each other (the so-called EPR effect), which implies that they remain effectively a single system however far they may subsequently separate spatially- a counterintuitive togetherness-in-separation that has been abundantly confirmed experimentally as a property of nature. The physical world looks more and more like a universe that would be the fitting creation of the trinitarian God, the One whose deepest reality is relational.” (Cf. John Polkinghorne, 2008, “Quantum Physics and Theology: An Unexpected Kinship” Published by Yale University Press). From 2 above, everything must be in a relationship to live. In Christianity God is a relatedness or a relationship of selfless love. It is our belief that God the Father being Love (1 John 4: 8) abandons the fullness of divinity and gives all he has to his image the Son (John 10:30; Col 1: 15-19; Phil 2: 6-11 ) who in turn returns this love in the Holy Spirit who is the binding love of Father and Son (John 15). The concept that God is relatedness or relational is found not only in Holy Scriptures but also in doctors of the Church including St. Thomas Aquinas and, in our days, Joseph Ratzinger (Bishop of Rome Emeritus Pope Benedict XVI). If this is true, then we can say that the cosmos is signed by the stamp of the Triune God of Christians. From 1, we all live in a cosmos still in development. Certainty is achieved beyond this life when we are in the togetherness of the family of the kingdom of God. Hell is reserved to those who never loved nor dared to explore the probability of opening themselves to the vulnerability of the other that in him God lives. According to St. Paul “For now we see in a mirror dimly but then face to face” (1 Cor. 13: 12). This entry was posted in Reason and Faith and tagged Big Bang, Catholic, Christian, evolution, faith and reason, Faith and Science, Genesis, George Farahat, John Polkinghorne, particle physics, quantum physics, quantum theology, reason and faith, science, science and faith, teilhard de chardin, theology, trinity, Triune God. Bookmark the permalink. Thank you Rosaliene. I have not read much of Lao-Tzu but I have read several different translations of Tao Te Ching. One of the interesting things I discovered is that the Dao of Lao-Tzu is similar to the Greek concept of the Logos; so much so that the Chinese translation of the beginning of the Gospel of John translates Logos to Dao so it reads “In the beginning was the Dao, and the Dao was with God, and the Dao was God.” I find it unfortunate that the typical English translation of “Logos” is “Word” which fails to capture the meaning of the Greek Logos or the Chinese Dao. I absolutely do believe scientists are looking at schematics created by God. Thank you for the article. Fascinating information to ponder. thanks for the link Heather. I did see this. I think maybe the LIKE button wasn’t working (as is often the case – oh well). Neither quantum physics nor science in general has anything to do with notions of “God” or “free will”. To think so is to have a profound misunderstanding of the nature and limits of science. Thank you for your comment. It provides an opportunity for clarification. You are absolutely correct that quantum mechanics, cosmology, genetics, biology and other sciences are independent disciplines and need to be studied as independent disciplines. However, it would not be accurate to say that science has nothing to say about the existence or non-existence of a Designer of the Universe (I’ll avoid the term “god” as it is too loaded for purposes of this discussion). For theists science, like other forms of revelation, can provide insight into the mind of the Creator just like watching a play can provide insight into the mind of the author. For example, Current head of the NIH and former Director of the Human Genome Project talks about the genetic complexity of human beings as a sign of the intelligence behind the design. Quantum physicist John Polkinghorne uses quantum mechanics to indicate that the Creator has a personality and is much more than mechanic designer. Anyone who watches the sunset can catch a glimpse into the poetry behind it all. Of course none of this points to theism or any specific form of “god” but they are all indications that there is much more to reality than what science can describe. I have written more about the problem of the “god” term and how atheists and theists can find common ground in science and wonder to find the unity the brings us together rather than focusing on our relatively minor differences. Ok.. I had missed this article… Thanks to Heather, I found it. Here is a summary and link to the emerging understanding of quantum physics and Quantum Theology..
Barbara, thank you so much for the kind words. Hope you have a wonderful weekend! This process has interesting correlations with the equation for the Core Theory: At the risk of oversimplifying, the Core Theory describes an action or process in which one configuration transitions to another configuration moved by energy force fields. To illustrate: The universe transitions to the universe-to-come powered by gravity, electromagnetism, and other forces; yet remains the universe. Can we not also call the Core Theory a Triune Process?